Small - $39.99 Only 6 left! Medium - $39.99 Only 5 left! Large - $29.99 X-Large - $39.99 Only 3 left! Once our favorite night of fun, Halloween, has passed there is another holiday that we all love here and that is Christmas! There are just so many fun things going on during this winter celebration. Decorating the outside of your home as well as the inside with bright and colorful lights is just the beginning! Then there’s the exchanging of gifts with loved ones and of course, who can forget the amazing ugly sweater parties! Our favorite part of Christmas is definitely all the ugly sweaters, they are just so unique and ugly each in their own way. 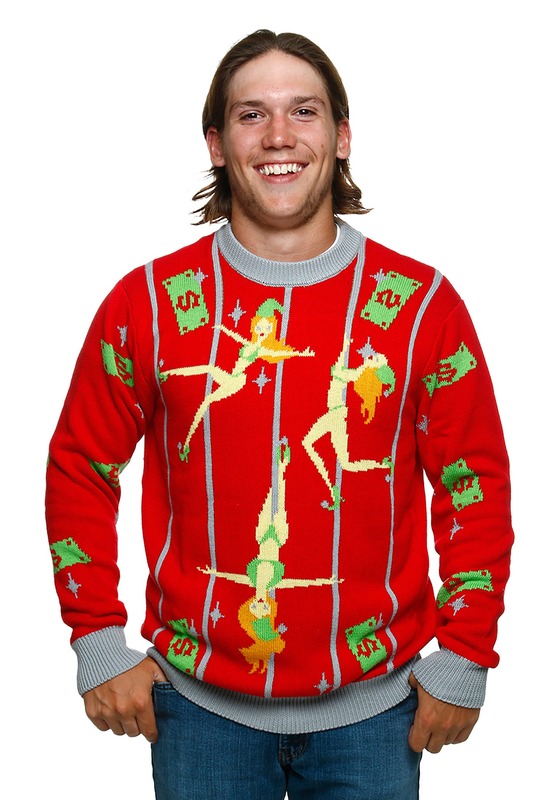 Have THE hideous sweater no one is expecting when you enter the party scene wearing this Pole Dancing Elves Ugly Christmas Sweater! Everyone will get a hoot out of the bills and exotic dancing elves printed over this cozy apparel. You’ll be able to give the best gift this Christmas with this ugly sweater, the gift of laughter!